Looking to treat your loved one to a special Valentine’s Day dinner?! Not a professional chef and aren’t sure where to start?! Look no further! 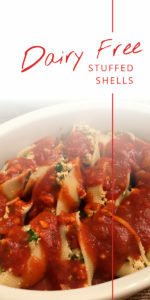 This delicious, simple, recipe for Dairy-Free Stuffed Shells is sure to go over well! Remove tofu from package, drain liquid, and wrap in towels. Use a tofu press for 20-25 minutes to drain excess liquid. Alternatively, you can use place the wrapped tofu on a cutting board and put heavy objects on top for the same amount of time. 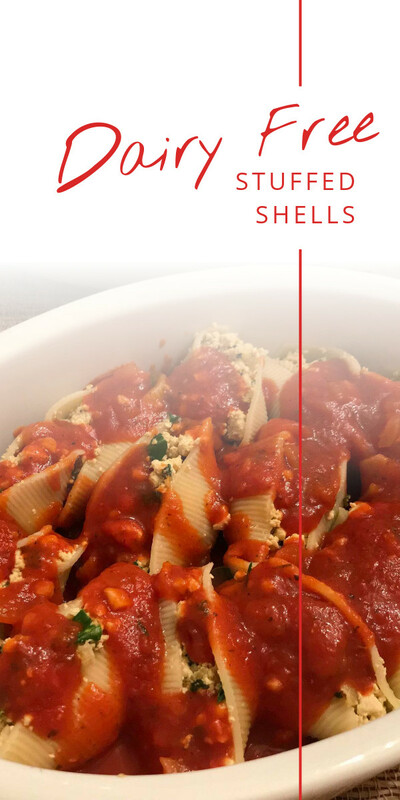 Cook your Jumbo Shells according to package directions, usually 8-11 minutes. You’ll want to make plenty of extras as some of the shells will break when you’re working with them. Set these aside once cooked to cool for ease of handling later. Preheat the oven to 400 degrees F. Grease a large baking dish and set aside for the finished product. For the tofu: In a large skillet, sauté the garlic and onion in oil for around 5 minutes. Once the onion is translucent, season with salt and pepper, and add parsley and basil to the pan, sauté for an additional 5 minutes. Now add the tofu into the pan by either crumbling it by hand or chopping it up in the food processor beforehand. The processor will make a more “clean” crumble, whereas by hand will leave your ricotta chunkier, this solely depends on your preference. Add to the tofu and greens, the nutritional yeast, salt, pepper, lemon, and cayenne. Continue to cook this over medium heat for 8-10 minutes, until most of the water is gone. Spoon ½ cup of pasta sauce into baking dish and cover the bottom of the pan. Add a couple tablespoons of ricotta to each shell, and place on top of the pasta sauce, continue this until you’re out of shells or room. Now top the shells with the remaining pasta sauce and any leftover ricotta cheese. Cover with foil poke holes for the dish to “breathe”. Bake for approximately 20 minutes or until heated through, serve!